St Mary of the Lake, Buena and Sheridan: Saturday, October 3rd at 5:15pm on the church steps. Please make sure your pets are leashed or in carriers, and please don't bring them inside the church. 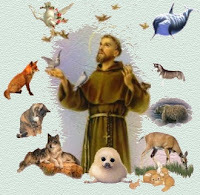 All Saints Episcopal Church, Wilson and Hermitage: "Bring your pets of all shapes and sizes to our celebration of the Feast of St. Francis at the 9 and 11am services [on Sunday, October 4th]. The 8am service is pet-free."